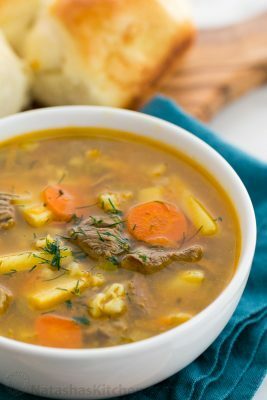 Rassolnik is a strange and classic soup made with barley, beef, pow-taters, carrots, and... pickles? You mean cucumbers, right? Nope, pickles as in dill pickles in a jar. That's right! I just devoured a large bowl of this goodness. It's hearty and the beef was tender and oh so satisfying. It's strangely good with the pickles. I tell you what, this pickle soup is definitely a comfort food; my Mom's favorite. In a large pot, partially cover with lid and cook 12 cups water, beef and barley with 1/2 Tbsp salt (30 min). Skim off any impurities that rise to the top to keep your soup clear. Sautee pickles with 1 Tbsp oil for a few minutes on medium/high heat. Add pickles, potatoes and sliced carrots to the pot and cook for an additional 10 min while making your Mirepoix a.k.a. "zazharka" (step 3). Zazharka: Add 3 Tbsp olive oil to a large skillet and sauté onion (2 min), then add grated carrot and sliced celery and continue to saute until carrots are soft (5 min). Stir 1 Tbsp tomato paste or ketchup into the pan and add this mixture to the soup pot. Toss in 2 bay leaves, 1/2 tsp black pepper, 2 Tbsp dill and more salt to taste (I added another 1/2 Tbsp salt). Continue to simmer for another 2 minutes or until your potatoes are fully cooked and can be easily pieced with a fork. Enjoy! Some people eat it with a dollop of sour cream, but I didn't think it needed it. I've tried both ways and I like the lighter taste without the sour cream. I hope you love it! !